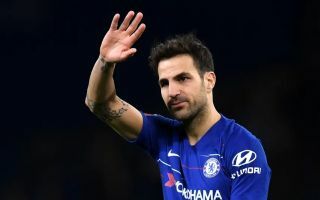 Chelsea midfielder Cesc Fabregas will have to wait until the summer to complete his move to AS Monaco unless the Blues find a January replacement. The Spanish playmaker waved a tearful goodbye to the Stamford Bridge faithful on Saturday after starting in the team’s 2-0 win against Nottingham Forest in the FA Cup, with a mooted move to Monaco thought to have already been sealed. However, according to Sky Sports, there has been a major new development to this story on Tuesday morning, as Chelsea have revealed that they will keep hold of Fabregas until the end of the season unless they can bring in a player to fill his boots during the winter window. Sky Sports reports that the 31-year-old has signed a three-year deal with the Ligue 1 outfit already but he will remain with the Blues until the summer if club bosses cannot identify his successor. Fabregas joined Chelsea from Barcelona in 2014 and he has since gone on to win two Premier League titles and the FA Cup while racking up over 150 appearances and contributing 22 goals. Unfortunately under the stewardship of Maurizio Sarri – who came in to replace outgoing Blues boss Antonio Conte last summer – he has fallen down the pecking order at Stamford Bridge, reduced to a bit-part role in the first half of the 2018-19 campaign. If he does end up having to stay a further six months that situation is unlikely to change, with Sarri preferring to start the likes of Jorginho, Mateo Kovacic and N’Golo Kante ahead of the Spain international. It is now certain that he will leave the club but he might have to endure more frustration on the sidelines unless Chelsea can land a suitable transfer target, with Cagliari’s Nicolo Barella top of the list – according to Sky Sports.